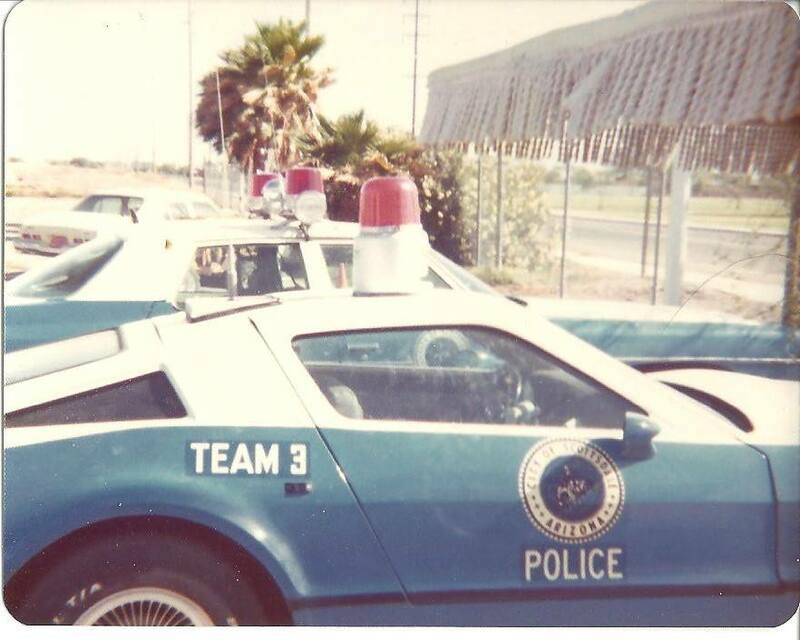 It is now December 2016, and finally 2 photos have surfaced of the Bricklin TEAM 3 Scottsdale Police Car ! Both photos are circa 1975, and reportedly taken at the Scottsdale City maintenance yard. I was wondering if any photos of the TEAM 3 Bricklin were ever going to show up. These may be the only 2 photos of the TEAM 3 SPD Bricklin that survive to this day. 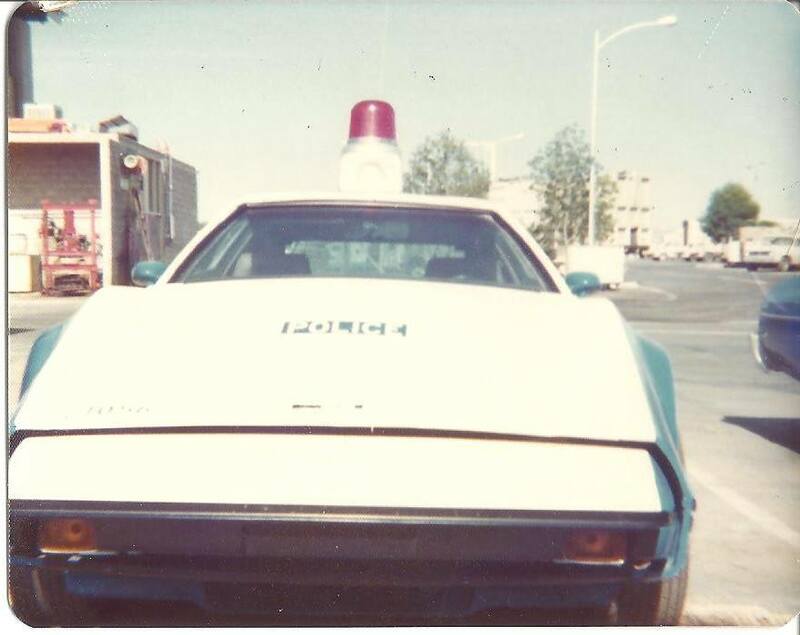 There are 2 known photos of the TEAM 1 SPD Bricklin... one is on this site. The other known picture of the TEAM 1 Bricklin appears on page 28, of the January 1976 issue of Road & Track magazine. And there are numerous photos of the TEAM 2 Bricklin that survive. The TEAM 2 Bricklin seems to have been the one used for the photo shoots. On the front picture of the TEAM 3 Bricklin, due to the amount of glare, it is difficult to make out the car number on the hood extension. 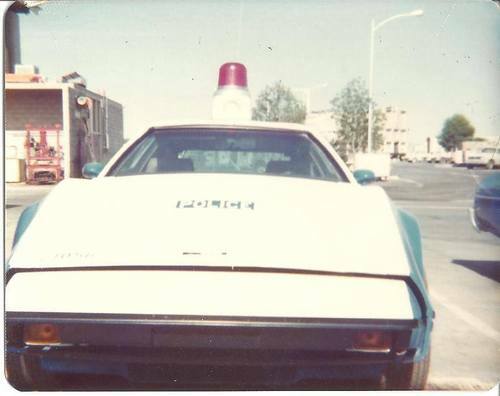 After extensive analysis of the photo, best guesstimate, is that the TEAM 3 Bricklin may have carried the number 1056 on the hood extension, and rear hatch. The TEAM 2 Bricklin carried the number 1057, of course. The number of the TEAM 1 Bricklin is not known. Both photos are via Kerry Stark. Many thanks to Kerry Stark for sharing the photos / information.